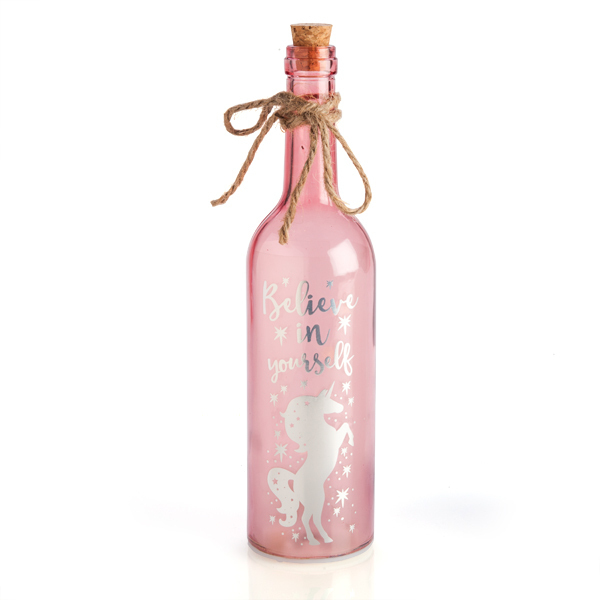 Believe in Yourself Wishlight Bottle | Encouraging self-empowerment! It's time to realise your dreams! This beautiful gift bottle contains a little bit of hope and encouragement, making a great decoration during the day, and a wonderful LED display at night. 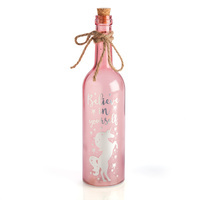 Your pink glass bottle features the heart-warming phase "Believe in Yourself" with a shiny and inspirational unicorn decal on the front. Turn it on and see the star-shaped LED's light up the night, bringing confidence and self- assurance when you need it most. A decorative keepsake bottle with cork and rope. Product dimensions: 7.3cm (l) x 7.3cm (w) x 29.7cm (h). 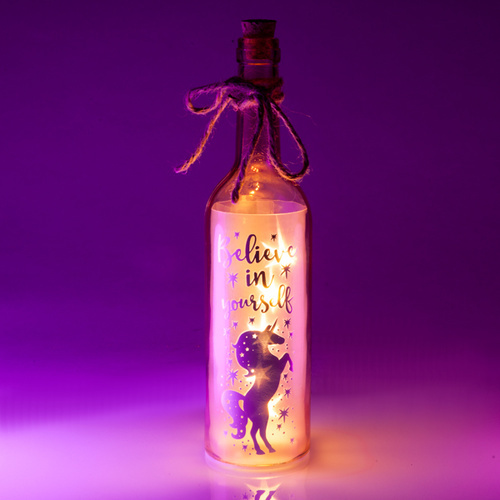 My believe in yourself wishlite bottle. I was disappointed to find it in a Xmas present box. I would have preferred to have a plain box as it is a give for my granddaughters 21st. I rate the bottle 5 star but for presentation 0 as it wasn’t a Christmas gift.